Sibiu is an important city in Transylvania, and it is situated near the geographical centre of Romania, about 20 km from the Fagaras Mountains. Sibiu was the largest and wealthiest of the seven walled citadels, known in German as the Siebenburgen, built in the 12th century by German settlers. In the 14th century, the city was already an important trade centre, and from the 1860s became the Metropolitan seat. Sections of the medieval wall still guard the historic area of the city which like Sighisoara and Brasov has a distinctly Germanic feel to it. Sibiu has two town levels: the Upper town, containing most of Sibiu's historic sights, which was the wealthier part and commercial outlet, and the Lower town, which served as the manufacturing area and it is surrounded by imposing city walls and defense towers overlooking the river Cibin that runs through Sibiu. In 2007 the city was the European Capital of Culture, together with Luxembourg. The city of Sibiu and its surroundings are some of the most visited areas in Romania, hosting one of the best preserved historical sites in the country. Many of the medieval fortifications have been kept in excellent conditions, and from 2004 Sibiu's old centre has become a UNESCO World Heritage Site. The historical centre includes the Great Square, Huet Square, the beautiful Passage of Steps connecting the upper town to the lower town, the well-known Bridge of Lies, Goldsmiths� Square and the Small Square. Sibiu and its surrounding area have many significant museums, with 12 institutions housing many collections of arts, archaeology or history. The city also lies in the vicinity of the Fagaras Mountains, a very popular trekking destination, and the Paltinis resort, a popular winter holiday destination. By its geographical positioning, Sibiu is one of the most important transportation hubs in Romania, with important roads and railway lines passing through it. A highway is planned to link Sibiu to the western border through Arad. The city has three train stations, with numerous InterCity trains connecting it to other major cities in Romania, such as Cluj-Napoca, Brasov, Craiova, Timisoara and Bucharest. Sibiu is also an important hub for national and international bus links - with the biggest passenger transporter in Romania is based here. Sibiu also has an international airport with direct connections to Munich, Stuttgart, Vienna, Madrid and Bucharest. 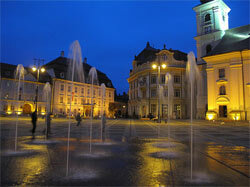 To get to the main city from the airport, you could use the Sibiu Airport Transfer service. Sibiu's local transportation system operates one tram line to the nearby village of Rasinari, 5 trolleybus lines and 25 bus lines. There are many taxi companies in Sibiu, all of them having the same fares as imposed by the city council regulations. You could also use the car rental services offered by EuroCars. Due to the economic boom in the recent years and to the increasing number of tourists, Sibiu has thought of many accommodation offers, such as hotels and hostels and the option of renting short and long term apartments. Finding the appropiate dining place in Sibiu isn't difficult. A great number of restaurants and bars are available, many of them serving traditional Romanian specialties. There are also fast foods available. Sibiu has several shopping centres available throughout the city, and there are also plenty of places to buy souvenirs at, the most common being related to Romanian folklore. Apart from the occasional events that take place in Sibiu, there is always a theatre or a cinema to go to for entertainment, as well as art exhibitions. Nightlife in Sibiu has a lot to offer on its own. Sibiu has something for everyone, like bars and clubs, discos, or even casinos.